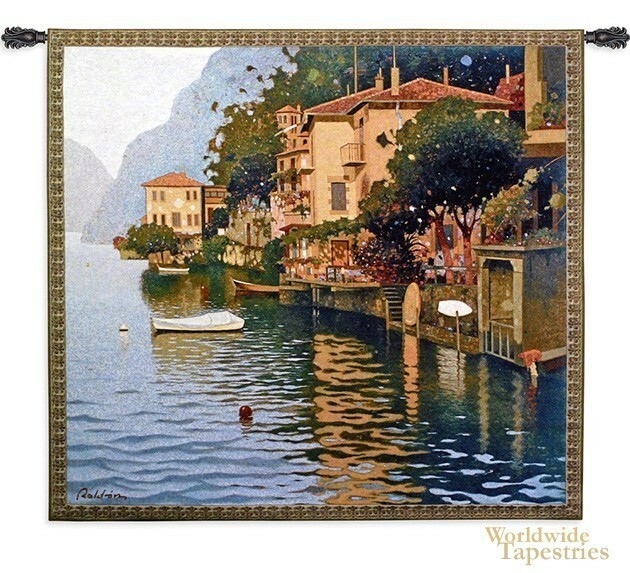 Reflejos En El Lago tapestry shows a beautiful scene from Lake Como. Reflejos En El Lago or Reflection on the Lake, shows the gorgeous villas on the water and reflections on the water in beautiful ripples. A boat is seen on the water and the greenery of the mountain side is also reflected in the water color. Lake Como is a most popular location for artists and aristocrats through the centuries, for the beauty of the region. Here the warm tones balance nicely with the cooler tones of the mountains and water. This Reflejos En El Lago tapestry is backed with lining and tunnel for easy hanging. Note: tapestry rod and tassels, where pictured, are not included in the price. Dimensions: W 55" x H 49"